Although everything looked a bit messy at the weekend, the market sold off today and closed at the low of the day. 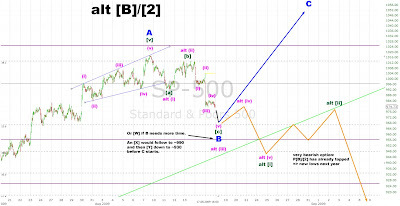 As mentioned in my previous post I expected lower prices on Monday for the bearish and the bullish count. Now it looks like the market is in the last leg either of [c] of B (bullish) or (iii) (bearish). At the moment I favor the bullish count with a last wave C up to finish this Primary  or [B] at the end of September between 1040 and 1120. But if we get five waves down from the top we must consider that the next big down wave might be underway.